I’ve already posted a poll where people can vote for the America’s Got Talent 2010 top 4. If you haven’t voted already, go and vote. The following are my thoughts on the AGT Season 5 top 10. I must admit that after doing interviews with all of the AGT top 10, I saw them in a different light as they performed. I felt a unique connection to them and really wanted them to succeed spectacularly. Anna and Patryk – How impressive was it to see Anna just get up after her fall and kill that routine? That’s really hard to do and she nailed it despite the fall (It’s already on YouTube). Although, in some weird way, Anna falling might have been the best thing that happened to them. She had me in tears at the end when she was fighting back the tears. The only thing I don’t get is why they would choose to do a quickstep for their performance. They call that dance the kiss of death on So You Think You Can Dance. Unfortunately, I think that’s going to be the case for Anna and Patryk too. Christina and Ali – I think there’s little doubt that this was their best vocal performance to date. Plus, Christina knocked it out of the park in a couple places. However, I think the song choice wasn’t that great for them since I don’t think the song matches their voting base. Either way, their growth on the show has been amazing. Fighting Gravity – Their performance tonight for me missed the wow factor. The lasers were cool and could be really cool with some more work. However, this performance was pretty disappointing. That said, America still loves them and so I’m sure we’ll be seeing them in the top 4. Jackie Evancho – What a perfect song choice tonight and executed perfectly. I’m sure technically there were a ton of mistakes, but most of America won’t know the difference. They’ll just remember this heavenly sound coming out of such a little girl. Plus, I think Jackie has a bit of advantage having won the YouTube voting as well. Jeremy Vanschoonhoven – Piers was correct that Jeremy is a crowd favorite. Unfortunately, I don’t think he’s going to make the top 4, but I won’t be surprised if he’s asked to go on the America’s Got Talent tour. His act is unique and has that fear factor that they would love to have on the America’s Got Talent tour. Unless they don’t want to cart around his huge set. Jeremy was perfection tonight in his performance and so you really can’t ask him to do more. Michael Grasso – At first I thought that Michael Grasso’s trick tonight was going to be a real disappointment. I thought he’d just appear in the box and I’d think, I’ve seen that before. I think the image of him in the box in his initial package helped with that deception. So, I was excited when he wasn’t in the box, but had made the switch. I selfishly want him to make it into the top 4, because I’d love to see his magic on the tour. Michael Grimm – I enjoyed Michael’s performance tonight. Although, it started off a bit stale for me. Him on a pedestal wasn’t really working for me. Once he got down and started moving and grooving to the song it took off for me and you could see him being a star in his genre. I’m a little tired of the grandparent storyline, but I’ll be really surprised if he’s not in the top 4. Prince Poppycock – Speechless is the right word. I’m not sure the song choice was best though. He actually sang the Star Spangled Banner very well, but I think some people might think it’s taking something very important lightly. Plus, Yankee Doodle Dandy was awkward for me. However, his persona of Prince Poppycock still oozed through and America LOVES it. Definitely a top 4 lock. Studio One Young Beast Society – Great performance with some great tricks. I loved how they tossed that little girl from feet to hands to who knows what across the stage. They hit it hard and it was an enjoyable act. Only problem is that compared to the over the top acts in the top 10, I think most people aren’t going to remember it. Taylor Mathews – I really didn’t think that Taylor had much of a chance at the top 4. I still think his chances are slim, but his performance was Taylor at his best. It showed off him and his talent for making a song his own. Plus, the screaming girls in the audience make me think that he might get more votes than we first imagine. Ok, those were my thoughts. What did you think of the America’s Got Talent 2010 top 10 performances? Last week we posted the poll to predict the America’s Got Talent 2010 winner and even posted the results from the AGT 2010 winner voting. However, that was before we saw the America’s Got Talent 2010 Top 10 performances. Plus, you could only vote for one person in the America’s Got Talent top 10. Thus, the following America’s Got Talent poll where you can vote for the America’s Got Talent top 4. Since 4 acts will be going through, you can vote for up to 4 acts you think should go through to the finale of America’s Got Talent. Let’s see who will be making it through to next week. Vote now! Last week after we found out the 10 members of the America’s Got Talent 2010 finals, we posted a poll to predict the Winner of America’s Got Talent season 5. I’ll be posting another poll now that we’ve seen the America’s Got Talent top 10 performances, but I thought it was interesting to see which acts readers of Pure America’s Got Talent think will be in the top 4 and performing in the America’s Got Tlaent finale. This poll has been really interesting. The initial voting had Jackie Evancho, Prince Poppycock and Fighting Gravity the clear runaway favorites. Then, Michael Grimm and Michael Grasso were battling it out for fourth place. However, after that initial voting (just within the last day or two) Michael Grimm has really pulled away and passed the other early favorites. Readers of this site have done a great job in the past of predicting the favorites, but I think tomorrow will be pretty exciting as the acts battle for that fourth spot in. As I mentioned yesterday, I’m going to be posting details from my interviews with the America’s Got Talent top 10. I was lucky enough to be able to interview all 10 of them. Here’s some details from my interview with Christina and Ali. First off, I’m glad I didn’t make a fool of myself, but for some reason I always thought that Christina was the older one, but she’s not. Ali is the older one and Christina is the younger one. As most of you readers know, I’ve been a big fan of Christina and Ali since I first saw them perform at the Las Vegas Auditions. I’m quite sure I did a horrible job at the interview because of that, but hopefully it was fun for them to talk to one of their fans. I know it was a real pleasure for me. First up, I talked to Ali. Unfortunately, because Christina and Ali were first and we had technical difficulties a couple times, we had to restart our conversation a number of times. Ali was incredibly gracious despite all the dropped calls (it wasn’t even a cell phone). Props to her for that. Of course, I’m still rattled a bit from the technical problems myself, but I did find out some interesting info. First, I had to ask Ali more details about what it’s like performing with cystic fibrosis (CF). I’m not sure she felt totally comfortable talking about it. I got the impression she didn’t really want that to be the focus of the conversation, but I (and I think many others were interested). Despite this, she did say that having CF was tough sometimes. However, Ali also said that singing is actually kind of therapeutic for them since the singing helps to clear out the lungs. I think she’d kind of mentioned this one before on the show, but it’s interesting to consider the idea. I told her a bit about my friend who has cystic fibrosis and giving him percussion therapy. She said yeah, that her dad did that for them also. Honestly, I didn’t want to dive into that anymore, because it’s heart breaking for me to even think about even though it’s what will likely save their lives. So, I moved on quickly to ask her what it would be like to perform in the Colosseum at Caesar’s Palace in Las Vegas where the regular performers are: Celine Dion, Cher, Elton John and Jerry Seinfeld? (I asked this of almost all the top 10). Ali then shared that Celine Dion is her idol and so performing on the stage where Celine performs would be a dream come true. Ali also shared with me that her sister gives her a lot of support back stage to help her feel more relaxed and less stressed. They’re pretty lucky to have each other to experience this together. When I asked Ali which of the top 10 (besides their act) was her favorite, she said Prince Poppycock. I think talked briefly with Christina since I’d already spent quite a bit of time with Ali. I asked Christina if she was glad that she was able to miss out on the start of school so she could be on the show. She answered that it was a nice thing to go on vacation and miss school, but that she still has to go to school. Her and a number of the other kids are required to go to school. It was also funny, because Christina mentioned that Ali would kind of tease her when she had to go to school. Pretty funny. Sounds like something I’d do with my siblings. As I mentioned in my last post, I had the chance Friday to interview all 10 members of the America’s Got Talent finals. It was quite the experience to talk with such a broad range of people. The bad news is that I had some technical difficulties recording the actual interviews that I got to do (dang technology). The good news is that I think I captured much of what was said and will be doing a blog post about each act covering what they said in my interviews. Watch for those over the next 2 days. Plus, tomorrow Marianya will be doing a 10 minute interview with some more of the acts. In it, we’re planning to focus on more details about the people and less about the competition. We should have audio of that one. A few quick comments about the experience. It’s really interesting to go from interviewing Michael Grasso and then to interview Anna and Patryk. One is an experience magician who’s traveled all over mastering his craft and has an amazing knowledge of magic, the magic industry and a ton of great stories before arriving at America’s Got Talent. The other is 2 young kids who are just starting to make stories and have experiences with the ballroom dance world. Yet, they both have talent and both are on the show with a chance at 1 million dollars. I’ll also just say that all of them were incredibly gracious with me. All of them seemed grateful to be a finalists and many of them were still in a bit of denial that they were actually a finalist. I’ll be posting more details for each of the top 10 America’s Got Talent finalists over the next 2 days. So, check back regularly to learn more about each act. Next time, I think I’m going to have to make the trip to LA to get some video of the finalists. Tomorrow I’m going to get the chance to interview many (and probably ALL) of the America’s Got Talent 2010 top 10. As always, I like to ask the readers of this site to let me know any questions they’d like to ask the acts during my interviews. It’s always more fun when you provide the question. I know this is short notice, but I thought I’d give you the chance. You can either leave a comment on this post, or if you prefer to send it to me in private, just submit it on our Contact Us page. Anna and Patryk – These two are just delightful. Plus, their execution was perfect in their semi final performance. Not necessarily technically, but it was the perfect mix of a slow dance opening with a nice high energy ending. It’s going to be difficult for them to replicate that again. Plus, it’s just silly when the judges on America’s Got Talent say that the dancing was flawless. They have no idea if it was flawless or not. I’m sure I know more about ballroom dancing than they do and I wouldn’t be ready to call it flawless. Either way, these two are going to provide for a great show that will be full of energy and excitement. However, I think Howie is right that they aren’t quite a Vegas show on their own. Anna is the cutest little thing though. I lover her reactions to it all. Christina & Ali – If you’ve ready much of this blog, you know their my sentimental favorites. I won’t rehash all my thoughts, but you can go read my 2 posts about Christina and Ali and the other AGT contestants comments on Christina and Ali. I expect they’ll deliver a similar performance as they’ve done before and have a chance (albeit a slim one) at making the top 4. Song choice will REALLY matter for them. Fighting Gravity – I’m always a little torn when it comes to Fighting Gravity. Mostly because their talent is something they took from other acts (there’s a ton of this stuff on YouTube). Sure, it’s a great concept, but it seems like I could get a group of friends together and do their act. It would take some work and some practice to do it well, but the talent isn’t as impressive if I could do it with a little bit of effort. This said, it seems like America really loves what they do and so I bet they’ll be heading right into the top 4. Jackie Evancho – Jackie seems like basically a lock for the top 4. She’s the Bianca Ryan of this season. A little girl with a big voice and people loved it. I was a little disappointed by her singing of one of my favorite songs last night. I preferred when she went for the ethereal sound of her first song. However, she is a sensation to be able to have her little body produce that sound. Plus, she’s just so cute and her comments make you laugh. A hard combination if you’re competing against her. Just don’t call her an opera singer. It’s not really even close to Opera. Jeremy VanSchoonhoven – I watched Jeremy’s video back again last night and it was just as exciting and terrifying and dangerous as it was the first time. I do downgrade him a touch since I know there are a lot of bike riders that rock hop (I think that’s what they call it). However, despite there being others that do it, go grab a bike and just try to hold the bike up in a standstill the way he does. It’s crazy hard to do what he’s doing. I’ll be interested to see what he can do in the next round. Against the other top 10 acts, I think he’ll have trouble making the top 4. Michael Grasso – Michael Grasso has kind of become a sentimental favorite of mine since he was kicked off the show in Las Vegas. I’ll set aside any thought that it was planned to bring him back from the start and just be grateful that they brought him back. He’s definitely the best all around magician they’ve ever had on America’s Got Talent. I’ve seen a trick or two on the show that were better than his tricks, but as a package his tricks have been really great. Although, I will admit that I hate magic on TV. Camera tricks aren’t magic in my book. Either way, he’s a Vegas talent in my book! If his trick just wows and shocks, he could make the top 4. Michael Grimm – I’ve had a bad taste in my mouth when it comes to Michael Grimm ever since I saw these videos of Michael performing some pretty big venues in Las Vegas. Not that I have a problem with acts having had previous success, but I hate when they give (or try to give) the impression that they haven’t done anything. Sure, the producers cut things certain ways, but Michael’s been selling stories the whole time. I guess I’ve just never seen a WOW performance from him either. He’s talented and has a unique style, but I’ve never loved his performance so much that I had to go watch it over and over again. I guess I compare him to Eli Mattson or Cas Haley (go look them up on YouTube) and Michael pales in comparison to what those two did on America’s Got Talent. Michael does seem like a cool guy and so I give him props for that. Despite my personal bias, I think Michael Grimm has a great shot at making the top 4. Prince Poppycock – I don’t know what to say about Prince Poppycock. I sat by him and his friend in the hall when he was sick in Las Vegas. You could tell he was worried about his throat and didn’t know what was going to happen. Plus, can you imagine sitting in that costume all day for a couple days in a row. He deserves a special medal just for that. No doubt he’s an exceptional performer and America seems to love it. He’s not quite the lock that Jackie Evancho is, but I bet he makes the top 4. Studio One Young Beast Society – They’re a respectable dance troop. I still can’t help but think of all the other great dance troops on a show like America’s Best Dance Crew. These guys are on that level, but I think we’ve seen the best of what they have to offer. 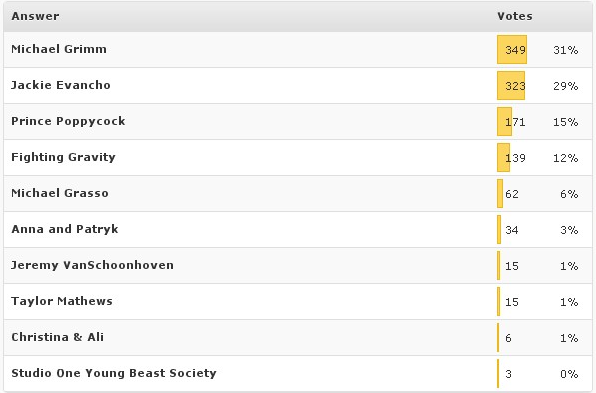 America’s got a lot of dance outlets, so I’ll be surprised if they vote Studio One Young Beast Society into the top 4. Taylor Mathews – I get scared for Taylor each time. He’s just so nervous and that makes me nervous. If he could relax and just perform, he could do very well. Although, I guess his nervousness is part of his charm. Song choice will be VERY important for him. Something popular that fits his voice well will really be key. I think America’s Got Talent has an older voting population than most shows where the tweens do all the voting. If Taylor makes it to the top 4, then I’ll be wrong in this assumption. There you go. That’s my analysis of the America’s Got Talent 2010 finalists and which ones will make it to the America’s Got Talent 2010 Top 4. What do you think? Now that we know the America’s Got Talent top 10 finalists, it’s time to vote for which of the top 10 finalists are going to win America’s Got Talent Season 5. Although, it does feel a little bit odd to call them finalists, but the show is still going to go from the top 10 to the top 4 who will then perform in the finale of America’s Got Talent. Either way, I think with 10 acts left we’re going to get a pretty good idea of who will be the America’s Got Talent 2010 winner. So, vote for who you think will win America’s Got Talent season 5. Be sure to vote so we can predict the winner. You’ve been great at predicting the America’s Got Talent Winner in the past, so let’s do it again. First, it’s nice to hear from someone who has had first hand interaction with Christina and Ali. Second, this says a lot about Airpocalypse and the type of people they are. I’m 100% behind Jason on this one! We spent time talking with them and their parents in Vegas and Hollywood and the whole time they were always cheerful and full of good things to say about every act. I think it takes talent to be able to sing like they do with the breathing problems that they have. My brother and I both have had pneumonia for the past couple weeks and I know first hand how hard it is to sing with fluid in your lungs… not saying I know what it feels like to have CF, but I know what it feels like to not be able to breath properly and try to sing at the same time. Christina and Ali are not only brave enough to devote their lives to something doctors have told them they’ll never be able to do properly, but they are extremely brave to do it in front of millions of Americans on live television. They may not be the most talented singers in the world… Many may not even feel they deserve to be this far in the competition… it’s not my place to say. But give them credit for what they are doing.